The Secrets of Elemental Quilting offers a peek into the unlimited potential of quilting design through pattern examples and a DVD. DVD includes in-depth trapunto lessons ~ regular trapunto, shadow trapunto and color trapunto! The Secrets of Elemental Quilting, showcases the author's creative design ideas through multiple element and pattern examples. These patterns will enhance Appliqué and Pieced quilts or can stand alone as a Wholecloth design. Longarmers, domestic machine quilters and hand quilters alike can use these elements (as many times as they like). The Secrets of Elemental Quilting offers a peek into the unlimited potential of quilting design. The author shares her secrets for creating complex motifs out of a single, simple design. The book and DVD include 3 trapunto lessons, enabling the reader to enhance any kind of quilt. This book is organized in 3 main sections to guide the reader in using the elements in their quilting: How to Use Elements, Patterns, and Trapunto How-To which includes instruction on Basic Trapunto, Shadow Trapunto and Color Trapunto. The accompanying DVD* offers a private lesson with Karen on these 3 Trapunto techniques. This book is softcover, 112 pages, 120 unlimited use compound elements, and includes a 60 minute DVD*. It retails for $24.95. P.S. - The Secrets of Elemental Quilting is a great companion workbook for Whitework Quilting. This book is [like] a sequel to Whitework Quilting. The book itself is more scrolls and designs than any information, but the DVD that comes with it is fantastic. It covers the how to from the Whitework Quilting book and more. Can't wait for her next book to come out. I just returned from Paducah, Kentucky during a week long cruise on the Mississippi Queen up the Mississippi. I visited the Quilt Museum during our short stop there. I picked up your book from their gift shop. Your designs are just fabulous. I thought I noticed your designs on some of the quilts there as well. Am I right? My visit there and the opportunity to get to see those beautiful quilts came unexpectedly. There were 42 of us from the local Gold Club on the cruise. One of the girls had been there before, and shared the information about the museum. It was great running into your book. Thanks for doing a superior job with what you love to do. Hope this encourages you to keep on sharing your ideas and thoughts through your books. Yet another wonderful book from Karen Mctavish, February 6, 2007. 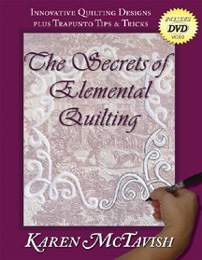 Karen McTavish is great at presenting her "Secrets of Elemental Quilting" in a detailed, but easy to understand book. You will enjoy reading about her ideas for machine quilting designs and may even want to try some of them out. Another great thing about her book is the DVD that is included. You can watch the DVD and actually see highlights of the detailed processes she describes in her book. Even if you never plan to make a show quilt, you will still be enthralled by the techniques she presents in her book and DVD.